I never expected to have to cook so much on holiday. We’ve been on the road holidaying in New Zealand. In our usual dysfunctional and last minute planning we booked this holiday too late and at peak season (yes for some reason we’ve always done our family holidays over Christmas and the New Year). Since we left it so late this year, there was literally no room in the inn for us and for the first time we have landed in a couple of youth hostels for accommodation. I remember years back when I had finished my A levels and was vacillating between doing journalism or becoming a doctor, I landed an internship in the Straits Times doing fluffy feature articles, of which one was about backpacker hostels in Singapore. I remember staring goggle-eyed at the $4 a night beds in Bencoolen Street (yes it was the 80s and such cheap accommodation did exist then) and being amazed that people would travel the world and bunk up in such places. Little did I realize that I would be doing so myself years on with 2 teenagers in tow. So armed with a bottle of bed bug spray, a tiny chopping board and my personal Zyliss paring knife, I have been tackling backpacker accommodations this holiday. I think if not for the gorgeous scenery and the unaccustomed freedom of long distance driving, I would have turned tail and run right home. The youth hostel in Aoraki Mount Cook region was actually pretty decent and was populated by older Koreans and Japanese who were having fun cooking rice and stews in the communal kitchen – it made me feel like I was cooking in the palace kitchens in the Korean series “Jewel in the Palace” (Dae Jang Geum). 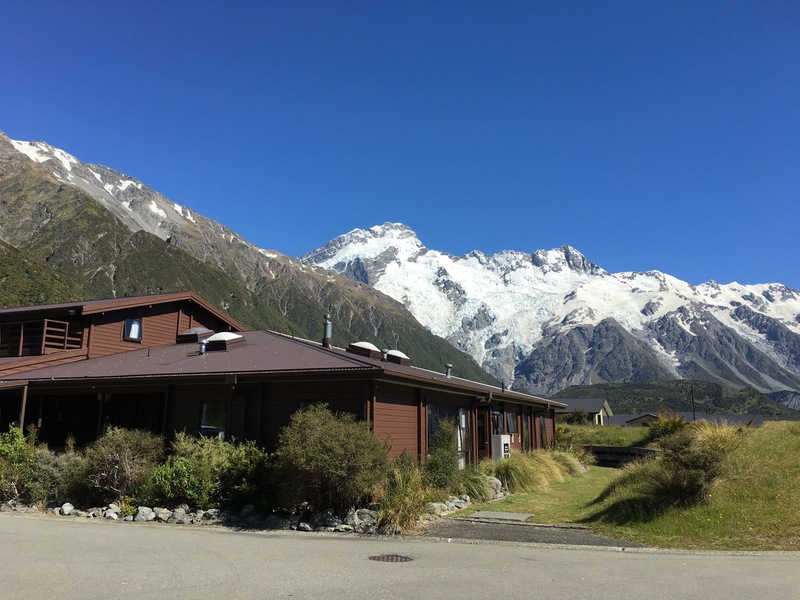 YHA hostel at Aoraki. Breathtaking surroundings for our simple family meals outdoors. 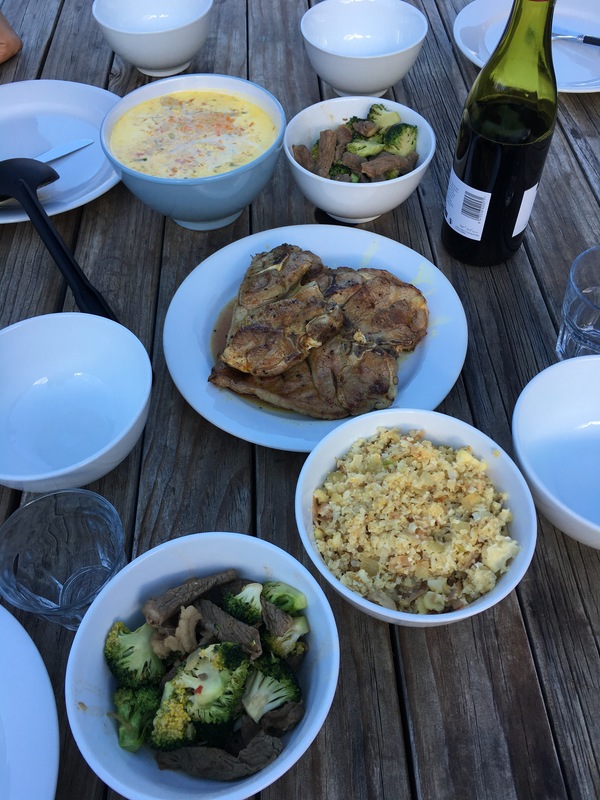 Rustic cooking with Moroccan lamb chops, stir fried beef and broccoli, cauliflower fried rice and vegetable cream soup. After being in the YHA hostel I thought I had the rough living bit down pat until we got to another youth hostel last night in Franz Josef glacier town and realized we had been having a cushy time until this point. If we hadn’t been driving for 7 hours straight before arriving and if we could have driven in the dark I would have demanded that we drive back to civilization. The hostel was…um…eclectic. Let’s just say that the owner’s idea of decor outside our room were a bunch of rusty saws. The place was a cross between a junk yard and a garage sale. This hostel was populated by young people who were sustained by endless booze, Uno and blackjack. The reviews on this hostel had been decent but I suspect that they were written either by their own staff or a bunch of young people with no money and no expectations. I probably sound like a Park Avenue Princess but hey, the last time I roughed it out was over 20 years ago at a girl guide camp. It’s been a while. The kitchen was like a set of Kitchen Nightmares and apart from a rather strange odour, there were a bunch of pots without handles and mismatched plates that I had to cook with. I confess that I did bring my trusty little mini-electric cooker with me but if I ever had to do this again I would also bring my own immersion blender, a skillet and a decent soup pot. This was hard. 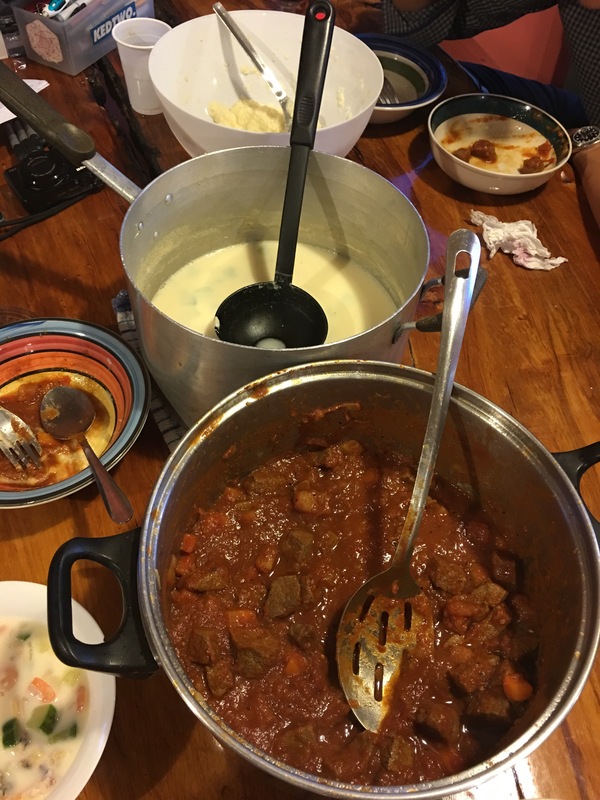 Kid #2 gamely wade into the mess and helped to figure out how to use an ancient blender for our cauliflower mash and we ended up being able to make a decent beef stew, cauliflower mash and seafood chowder. By now most people would have wondered why we didn’t just eat out at the local cafe instead of struggling with cooking but the truth is that most of us were eating low carb and the usual fish and chips fare would not have worked out for us. Still, the amazing thing is that we did manage to come up with a decent few dishes and with only salt and pepper for seasoning! This is a miracle to me as I am so used to a fully stocked spice cupboard (at the last count I had 33 types of spices and dried herbs). The other challenge was that the meal had to be whipped up quickly as we were tired after a full day of traveling and we only started cooking at 8 pm that night. 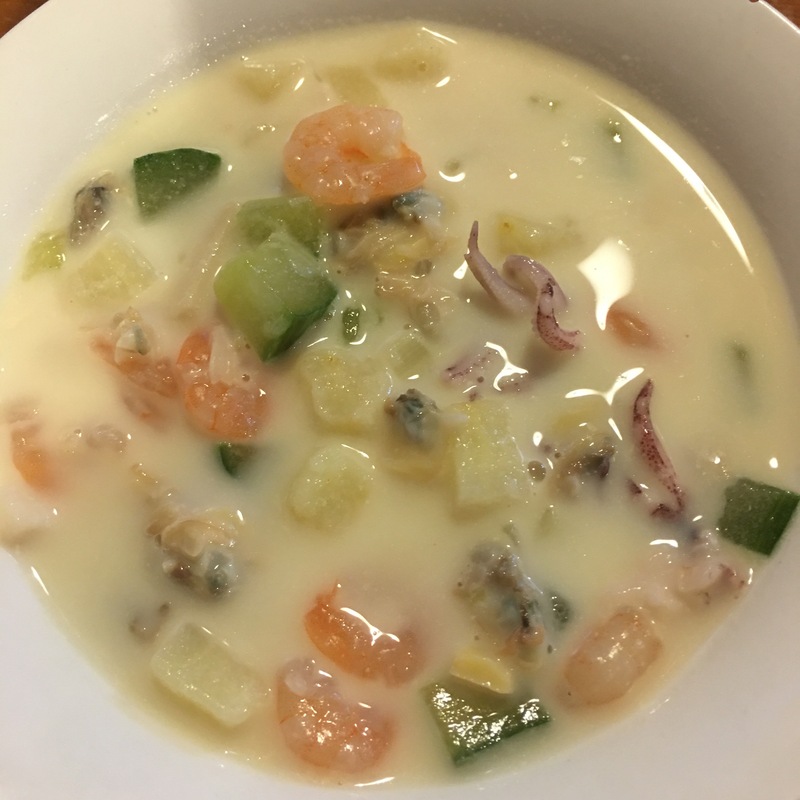 So I am pretty proud of this meal and here is the relatively low-carb seafood chowder that I made last night while roughing it out. Just to qualify that it is relatively low carb as I used parsnips which are starchy but slightly less carb content than potatoes which are the usual backbone of hearty chowders. Parsnips do have a good amount of dietary fiber and only have 17g carbs per 100g. To make this chowder even lower carb I would substitute the parsnips for cauliflower florets (which I had run out of since they all ended up in the mash). In a large soup pot, melt the butter and sauté the onions till fragrant. Add the parsnips to the pot and sauté another minute further, then add the water, salt and pepper and bring the water to a boil, then simmer for about 20 minutes. Add the cucumber and seafood and simmer for another 5-10 minutes. Add the cream and stir through, adjusting the seasoning. Serve hot. If I weren’t roughing it out I would add chopped parsley or chives to this chowder.